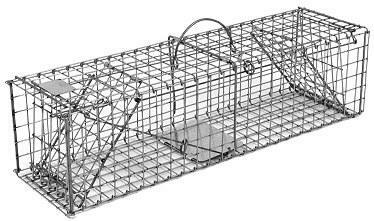 Collapsible Live Traps are just the thing to use when large numbers of traps are involved or storage is a problem. 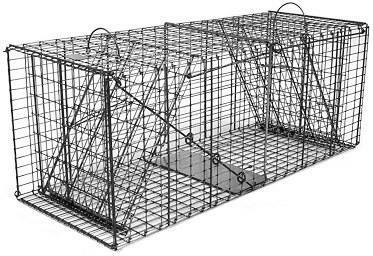 Our Collapsible Traps are made from the same durable materials, great design, and trap animals with the same reliability as our Rigid Traps. The only difference, is added a space saving feature that allows the traps to fold flat and set back up, in just a few seconds. And, they only require one-tenth the storage space needed for rigid traps. ShopTJB now offers three sizes of collapsible dog traps, with rear sliding doors. 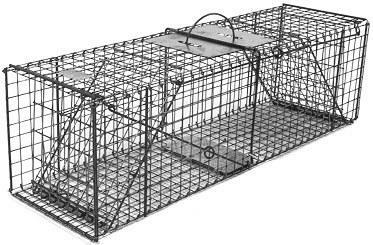 Collapsible Traps are manufactured in a variety of different sizes, ranging from chipmunk and rat, to large dog. All collapsible live traps are completely assembled, guaranteed, and shipped to your home or business in a ready to use condition. Trap doors at both ends allow animals to enter the trap from either end, increasing your chances of success. When an animal sets off the trap by stepping on the trip pan, both spring loaded doors simutaneously snap shut and lock into place, making escape virtually impossible.